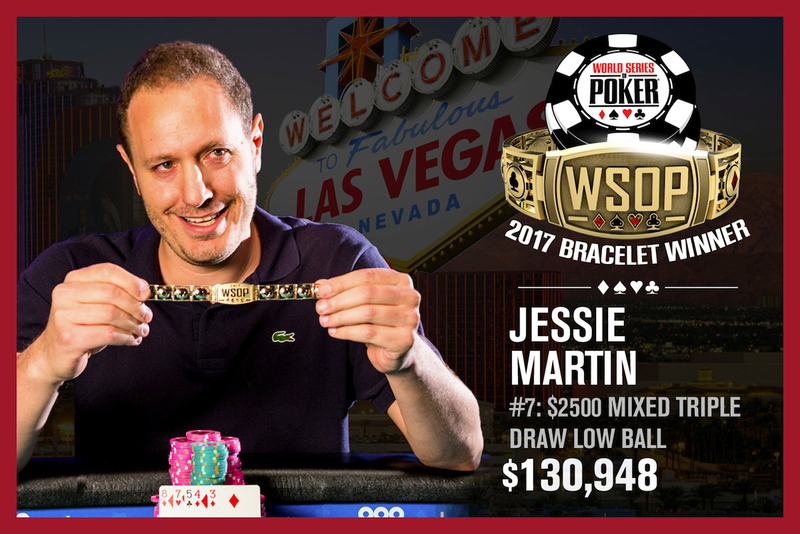 Jesse Martin has joined the vaunted ranks of players with multiple World Series of Poker gold bracelets. The poker pro outlasted a field of 225 entries in the $2,500 buy-in mixed triple draw lowball event to capture his second WSOP title and the top prize of $130,948. This was also Martin’s 49th cash and eighth final-table finish in a WSOP event. Martin now has more than $2.8 million in career live tournament earnings, with the majority of that coming from cashes in events at the series. This tournament featured a mix of ace-to-five triple draw, deuce-to-seven triple draw, and badugi. The final day began seven handed, which necessitated the player under-the-gun sitting out because the triple draw games are played with a maximum of six players. Martin came into the day in second chip position, but he had plenty of stiff competition to deal with including Jared Bleznick (5th – $24,356), Chris Bjorin (3rd – $52,671) and James Obst (2nd – $80,922). Martin made it down to heads-up play against Obst holding only a handful of big bets more than the Australian poker pro. Martin quickly extended his lead, and although Obst was able to mount a small comeback, Martin was able to take more than a 3-to-1 advantage by the time the final hand arose. In deuce-to-seven triple draw with limits of 30,000 – 60,000 Obst raised and Jesse Martin called. Martin drew two while Obst took three. After the first draw Martin bet, Obst raised and Martin three-bet. Obst made the call and Martin stood pat. Obst drew one card. Martin bet and called after Obst raised. Both players now opted to stand pat. Martin bet, which was enough to put Obst all in. He made the call with the 10 7 6 4 2 only to have Martin show the 8 7 5 4 3 for the eight-seven low. With that Martin secured the pot and the title, sending Obst home just short of his first WSOP gold bracelet. This was the second time he finished as the runner-up in a WSOP event, having placed second to Jason Mercier in the $10,000 H.O.R.S.E. championship last year.